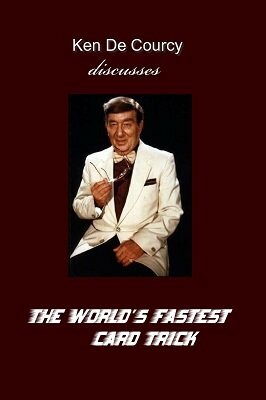 Ken de Courcy Discusses "The World's Fastest Card Trick"
The manuscript is complete and explains everything in detail with many illustrations from the author himself. "Joe Karson will go down in magical history as the man who invented 'Zombie', although half the people using it have probably never heard of him. He produced a number of other mysteries, amongst them "THE WORLD'S FASTEST CARD TRICK". This was an ingenious, one-person version of an old two-handed vaudeville skit. Over the years this has been of great value to me. Joe purposely included a simple climax to it to make it complete, but he obviously assumed any performer who used it would prefer to make his own. Since the booklet in which the trick was described was published over thirty years ago, the effect will be new, both to magicians and audiences. During that time I have performed it hundreds of times using different finishes. These are described in this treatise, together with my own favorite presentation. Give the trick the rehearsal it deserves, try it out and I'm sure you'll join me in thanking Joe Karson for a truly entertaining creation". 1st digital edition 2013, 21 pages.